Over the past few years, more companies have relised the financial and environmental benefits to be gained by making the most of their organic waste streams. In the UK, the anaerobic digestion (AD) industry which converts millions of tonnes of food, sewage and farm waste into renewable energy (biogas) and biofertiliser has been one of the country's biggest success stories in recent times. Over the past 12 months, the biomethane sector of the AD industry has seen more growth than the rest. 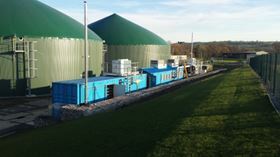 According to the Anaerobic Digestion Market Report of December 2016 (ADBA) The number of AD plant operators upgrading their biogas to biomethane has doubled in a year, meaning there are now 90 plants generating ‘green gas’ in the UK. With the UK Government confirming an increase in the Renewable Heat Incentive (RHI) tariffs from April 2017, the future for biomethane producers looks set to remain bright. What’s more, recent developments in biogas upgrading equipment mean that more waste producers than ever can make the dash to gas. Myth 1: It’s more efficient to generate electricity and heat through a CHP engine than to upgrade biogas to biomethane. By removing (mainly) carbon dioxide, biogas can be upgraded into biomethane; a renewable fuel which can be used as a natural gas replacement for industrial purposes, injected into the gas grid, compressed and used as vehicle fuel (bio-CNG), or polished and liquefied to produce bio-LNG. Power generation from biogas is only 42% efficient at best, as co-produced heat is often not able to be used. In comparison, biomethane efficiency is 99.5%. Myth 2: Biomethane upgrading causes a significant methane ‘slip’, which is harmful to the environment and means producers won’t be eligible for renewable incentive payments. In the past, biomethane upgrading equipment could only recover part of the gas produced and would ‘slip’ the remaining proportion of methane in the raw biogas to the atmosphere. However, the technology has advanced significantly in recent years and some upgrading equipment, including DMT’s membrane based Carborex MS unit, slips as little as just 0.5%. This complies with UK sustainability criteria, essential for claiming the RHI. Myth 3: Upgrading technology is complicated, takes months to set up and requires significant upkeep. There are a number of biogas upgrading technologies on the market, including pressurised water scrubbing, catalytic absorption/amine wash, pressure swing absorption, cryogenic liquefaction and highly selective membrane separation. Some are more complicated than others, but membrane separation, for example, requires no water, chemicals or scrubbers. There are plug-and-play systems on the market now that can be operated with just a single button, and can also be containerised, allowing for easy transportation. These kinds of systems can provide biomethane ‘on-spec’ within a couple of minutes and are able to be remotely monitored 24/7. Myth 4: Biomethane plants need access to the gas grid network, meaning the technology is too expensive for more remote sites. The UK has a highly developed gas infrastructure, and so many biomethane producers inject their green gas straight into the grid. While this enables them to transport large quantities of gas relatively cheaply to end-users without being limited by local demand, grid access is subject to strict legislation. For those sites where no widespread gas infrastructure is available within a reasonable distance, it can prove more cost effective to produce bio-CNG (compressed natural gas). Upgrading biogas to CNG quality-biomethane of >96 per cent using Carborex MS (compressed to 250 bar with a CNG compressor and stored in gas bottles suitable for transport) has an average return on investment of just three years. Myth 5: Biomethane as a transport fuel will never take off – it’s too heavy and difficult to move around the country, and there are too few fuelling stations. London breached its annual air pollution limit for 2017 in just five days, so it’s clear a real alternative to diesel needs to be found fast. Countries such as Italy, Sweden and Pakistan are already benefitting from gas vehicles, and biomethane-based LNG (liquefied natural gas) is rapidly gaining momentum worldwide as the fuel of choice for HGVs, ships and buses. In fact, bio-LNG is the most cost effective fuel available for CO2 emissions reduction (up to 70% less compared to diesel). And given that LNG reduces the volume of biomethane by 600 times, liquefaction is an excellent way to both store and transport the fuel. Most vehicle manufacturers now offer both LNG and CNG models, and there are around 15 natural gas refuelling stations across the UK. For those companies looking to future-proof their supply of gas fuel, installing an on-site CNG fuelling station is also an option. DMT is an international supplier of membrane-based upgrading technology and products for desulphurization, water treatment and resource recovery. The compay also supplies CNG fuelling stations.